Ergonomics for office spaces is something that is always spoken about and given importance to, due to long seating duration and the ill-effects it could have on the health of employees. What is often neglected, especially in India is the importance of seating ergonomics in schools. A recent survey shows that over 83% of school children sit at desks and chairs that are not suitable for their body height – this can result in poor posture and back related issues over time. It is therefore important for schools to wake up and do what it takes to ensure good ergonomics in classrooms which in turn ensures good health and better learning. Ergonomically designed furniture allows for comfortable and flexible seating enabling children to concentrate and learn better. Children range wildly in height, size, strength and intellectual ability. Classroom seating should promote healthy postures from a young age, especially since young bodies develop rapidly. Children spend as long as nine hours in a classroom and having a good posture helps them concentrate well since they are not being distracted by discomfort which can arise due to various factors such as strain and muscle exertion. Ergonomically designed furniture helps avoid problems with blood circulation, muscles and connective tissues thus enabling better health. Traditional classroom seating was typically designed to enforce an upright posture; conventional chairs have rigid seats that incline backwards and merge into a seating hollow. This position can create an excess amount of muscle exertion and can also compress the diaphragm affecting breathing and voice quality. Keeping the above factors in consideration, it is essential to have furniture designed to avoid the possible health hazards. Hence, it is vital to start the practice of having the right furniture for the right age categories at the earliest! Ergonomically designed furniture enhances learning experience by providing flexibility to accommodate different teaching and learning styles. Lightweight systems allow students to move desks into cluster formations for group work and then back into rows for lecture or individual work. Swivel seating allows students to adjust their seating positions – and focus. Larger work surfaces on desks allow the use of multiple mediums – from notebooks to laptops. Ergonomically designed furniture is designed to adjust in size, provide the right fit, grow with the student and enhance curriculum. School furniture is an environmental factor that is too often neglected, especially considering the fact that students spend close to 15,000+ hours sitting down during their school years. It has been observed that too often, ‘one size-fits all’ has been the mantra — the same furniture selected for all classrooms and learning spaces across multiple campuses. Furniture must fit the children, allow movement and hence invariably encourage a good posture. Movement plays an important part in seating. Research has found that “A school in which movement is supported and encouraged has a positive effect on the learning ability and attentiveness of the children”. Small changes such as the introduction of sloping work surfaces and a less negatively raked seat angle have been shown to improve sitting behaviour as well as increase children’s satisfaction and comfort. 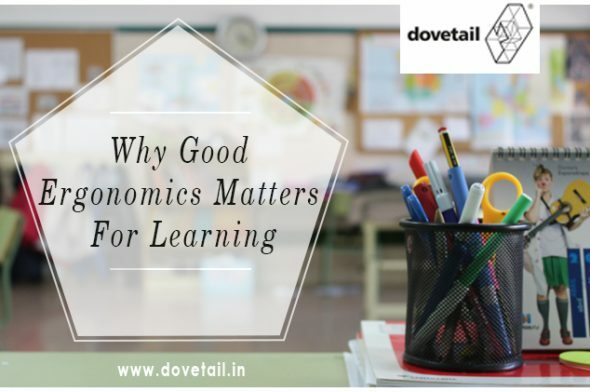 Dovetail is bringing in over two decades of its experience and expertise in furniture and fixtures to launch the “The Future Learning Environment” – A first of its kind initiative to introduce Indian schools to ergonomics, interactive, flexible and multi-functional design in classrooms, labs and libraries.